Carl W. Neff, World War I veteran. Carl William Neff was an ordinary man who did extraordinary things. He was killed in action during World War I while running a message during combat. He is the namesake of the American Legion Carl Neff Post 571 in Wesleyville, PA.
Carl was born in Harborcreek, PA on January 17, 1892 and was the oldest of nine children. He briefly worked at General Electric, but mainly worked in the farming industry. 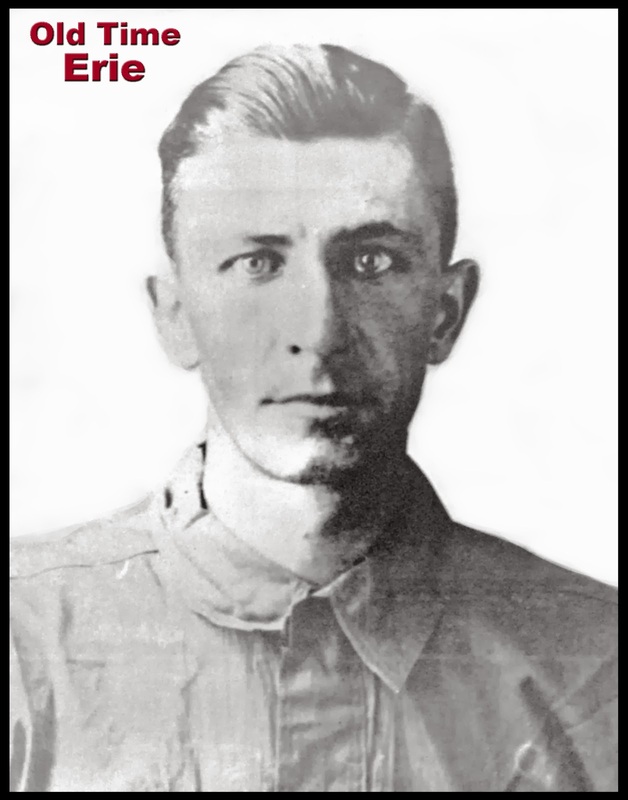 He enlisted in the U.S. Army on May 29, 1918, despite being entitled to an exemption from war for farm workers. He was assigned to Machine Gun Company, 60th Infantry, Fifth Division and was sent to France, where he fought in the Meuse-Argonne Offensive. Lt. Merrick wrote about the heroic actions of Carl Neff: "His willingness and smiling reliability in the midst of a series of attacks and daily infernos without food and water, sick and terribly exhausted and sometimes with the battle against us, was note-worthy, even in a band of desperate men. Finally, however, his exhaustion made it a great effort to perform his duty, but with great resolution he continued as messenger. Seeing he made the trip at an extreme effort, I told him to rest with the others. We took positions in shell holes about midnight. Before morning the Germans shelled us, blowing up an ammunition dump in our midst. Under orders of Captain Warfield, deceased, (then acting Major), we rushed into the exploding and blazing boxes of hand grenades, machine gun ammunition, and salvaged as much as possible for impending attacks. We experienced casualties here. Carl was evacuated from these woods. However, I can assure you that his actions previous to this time are well and gratefully remembered and that his cheerful service was a credit to those whom he represented." Medic Frank A. Frazier wrote to his mother and asked if she could contact Carl's mother. Frank's letter said, "His tag read Carl W. Neff, we buried him on Montfaucon Oct. 29th. I imagine he was killed Oct. 28th. He was a large man, 5ft. 11 inches and would probably weigh 175 lbs. He was hit by machine gun bullets in three or four different places. We lived, or rather, existed on Montfaucon during October." Carl's body was returned to the United States and he was buried in the North East Cemetery. Visit the American Legion Carl Neff Post 571 at 1917 Eastern Avenue in Erie County, PA to view the full text of this tribute to Carl Neff. The post was formed by veterans from Wesleyville, Lawrence Park and Harborcreek, PA. 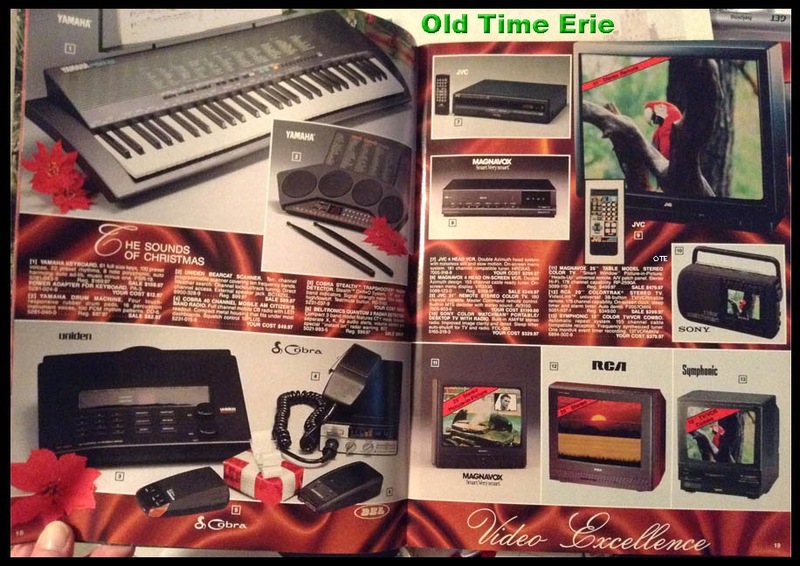 Please check Old Time Erie for historic facts and photos of Erie, Pennsylvania. 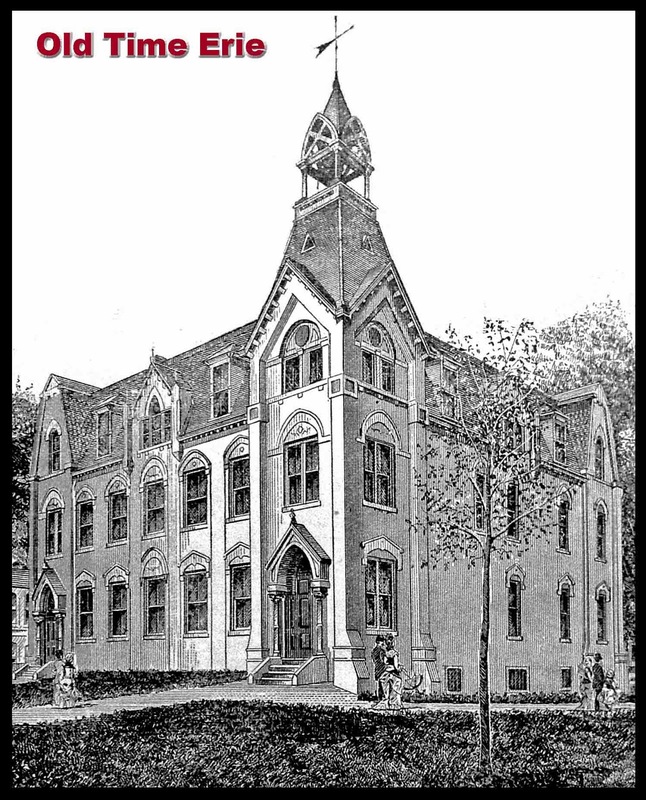 Long before the Northwest Pennsylvania Collegiate Academy made its debut as a college-prep magnet school in Erie, PA, there was a public high school known as Academy High School. But before the the NPCA and AHS, there was another Academy, the granddaddy of them all- Erie Academy. Erie Academy was incorporated on March 25, 1817. Its trustees included Rev. Robert Reid, R. S. Reed, Robert Brown, Thomas Forster, Thomas Wilson, J. C. Wallace, Judah Colt, T. H. Sill and Giles Sanford. During the 1859-60 school year there were 239 students; 115 boys and 124 girls. The tuition in 1891 was $400 per anum and students were admitted from throughout the region. Erie Academy had a couple of different locations. The one in this illustration was located on Peach Street between 9th and 10th. Not to be confused with the old Central High School on Sassafras Street between 10th and 11th Streets (Central Tech). "In 1878 the old academy buildings were entirely remodeled and modernized. The stone and brick structure gave place to an imposing edifice surmounted with a Gothic mansard roof, making the building three stories high. There are two main entrances facing Ninth Street. Upon the ground floor are two fine study rooms, spacious halls and stair cases for reaching the second floor, where are two similar large rooms for the intermediate departments, with two smaller ones for recitations. The third story is all in one large hall, with high ceilings suitable for lectures, drill room and school exhibitions." -Erie Pennsylvania Illustrated (1888). The approximate location of the old Erie Academy would be the present site of Tullio Towers at 21 West 9th St. in downtown Erie, PA. This neat old brick house was constructed around 1842 and was the home of James M. Sterrett. James owned a tannery on East 5th Street between Holland and German. He died ten years later and his descendants lived in the home until the end of the century. His granddaughter willed the house to the Florence Crittenton Home. Since its incorporation, 472 girls and their babies have been cared for. The Home can care for twelve girls and ten babies…Were it not for the Florence Crittenton Home, the girls, instead of receiving proper medical attention and necessary instruction and training which enables them to start life anew, would suffer, bear the shame of publicity and be branded as social outcasts. With such handicaps they would not be able to start out in life with a fair opportunity to succeed. The guilty fathers would not be induced to accept their responsibilities at home and parents and relatives, humiliated by the conduct of the girls, would not be brought to see their duties in a true light. The girls themselves would not learn to become strong again and care for their children and home." -Albion News, February 23, 1922. The Florence Crittenton Home remained in the old Sterrett Home from 1905 until 1982, when it moved to East 6th St. near Reed. 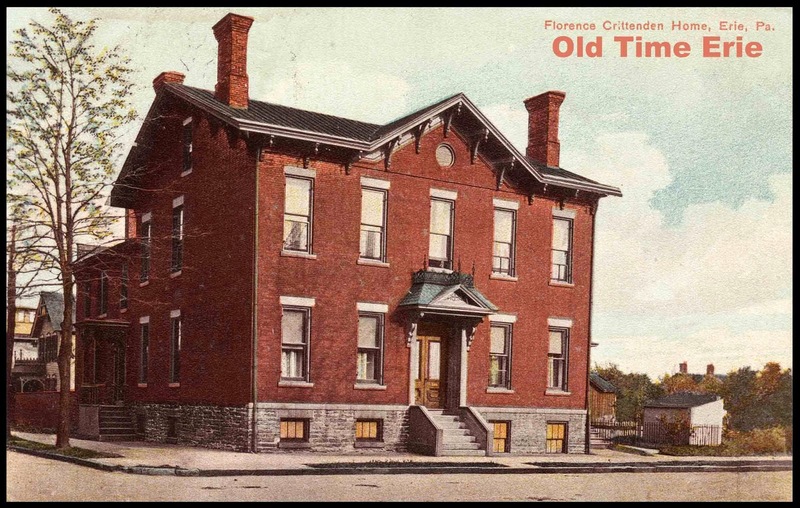 The Sterrett house on the southeast corner of 5th and Holland was demolished around that time and is now a parking lot for Erie Insurance. 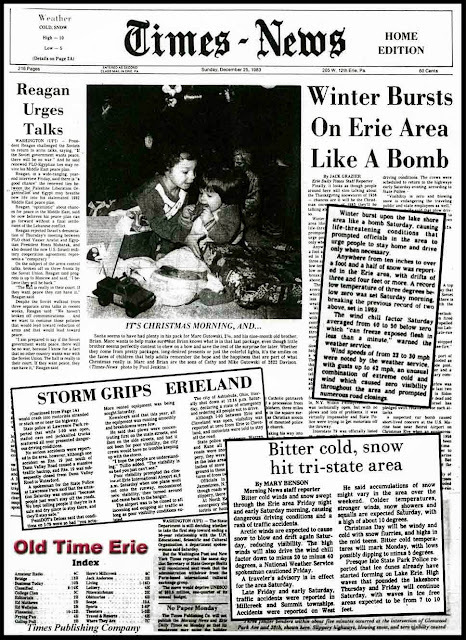 Storm clouds hugged Erie in its icy grip over the Christmas holiday in 1983. The storm hit on December 24, 1983, just as travelers were making their way to visit family and friends. Depending on where you lived, you likely had between ten inches and 1.5 feet of snow in your yard, not counting snow drifts of 3-4 feet in some areas. And the wind? Brrrrr! Cold enough to freeze exposed skin in less than a minute. "Finally, it looks as though people around here will stop talking about the Thanksgiving snowstorm of 1956- chances are it will be the Christmas snowstorm of 1983 they'll be talking about for the next 30 years or so," wrote Jack Grazier in the Erie Times-News. Well, it's 30 years later, and guess what? They're still talking about Thanksgiving of 1956 as if it were yesterday. The 1983 storm, on the other hand, is getting a little hazy, at least in my household. Me: "Remember when you came to pick me up but couldn't get on our street because there was too much snow?" My husband: "No." "Don't you remember, you had to park on 21st and Ash and walk to my place?" Still nothing. I'm sure you've seen postcards of places that used to exist and wondered, "Where was that?" Me too. So I thought it would be fun to put together a graphic to show you where the old Reed Hotel was located. Keep in mind that this is not to scale, just a representation of what the corner of French Street and North Park Row used to look like. The new picture of Erie Insurance on the right was taken in 2013. Click here for a more detailed narrative of the Reed House hotel in Perry Square. The spot where the hotel used to sit is now a parking lot for Erie Insurance. Keep this image in mind the next time you visit the park. Just stand near the Edison electric fountain and look north. Pictured above are membership cards to the Erie County Sportsman's League from 1952 and 1953 that belonged to Ralph Schaffner. This club was a member of the Pennsylvania Federation of Sportsman's Clubs. Perhaps you can help tell the story of the ECSL. Where was the club's shooting range? What caliber was permitted on the range? Did members shoot trap, pistols or rifles? Did it include muzzle loaders? Did they have an expert who helped hunters site their guns? Was this the precursor to the Erie County Sportsmen's League? I know- so many questions….I'll update this story when I find more info. 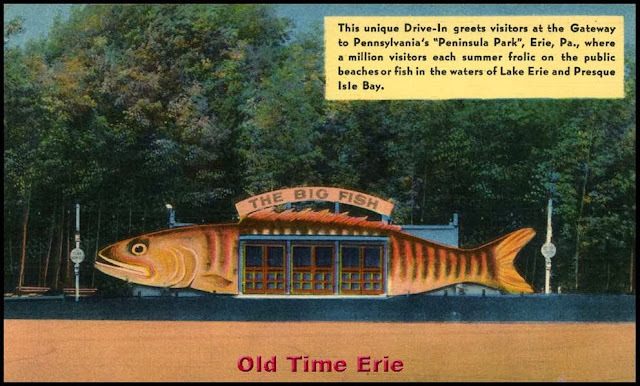 Old Time Erie illustration by A. Hintenach. Pearl Harbor was attacked on December 7th, 1941. This is one event that our nation will never forget. 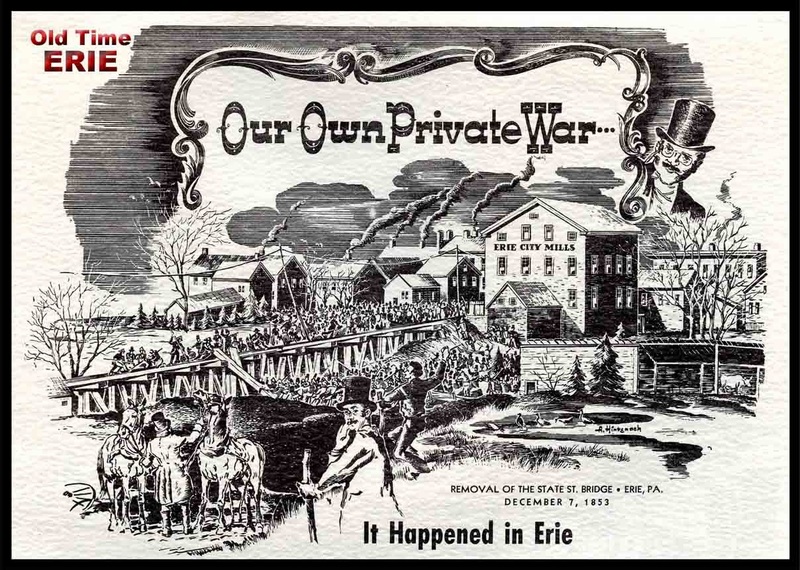 Although far less tragic, few people are aware of an event that happened on December 7th, 1853 that put Erie, PA in the national spotlight. This is the story of the Gauge War. "There had been haggling between the citizens and transfer men. Two changes of cargo between Erie and the New York line became unbearable…trackage was ripped up at Erie and Harborcreek on dark nights, to be stubbornly replaced the next day. Tempers flared. Action was demanded. Down came the bridge. Not a shot was fired and casualties from rocks, rotten eggs and clubs were few. The guerrilla warfare between the North East and Erie Railroad transfer men and the citizenry started thus and continued for over six months to end in a fanfare of flying debris. The 'Railroad War' passed into the musty archives of Erieana. And all because this connecting link between Ohio and New York was too wide between tracks to run through trains." 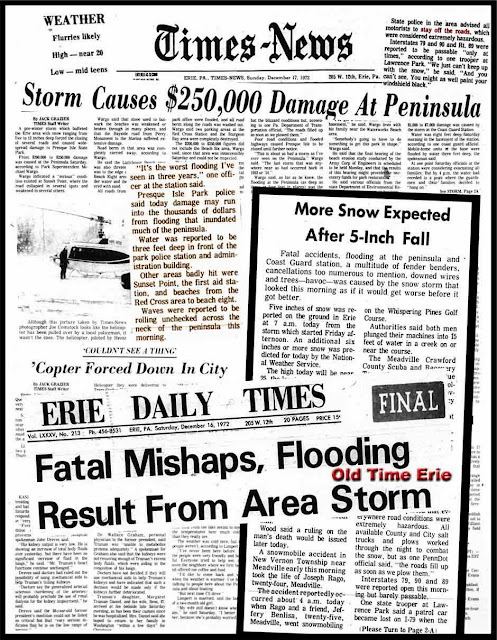 -Landmarks of Old Erieland by Security-Peoples Trust Co.
A two day snowstorm during the winter of '72 battered the Erie Public Dock and caused thousand of dollars worth of damage to Presque Isle State Park. The Times Publishing Company covered the event extensively in its newspapers, the Erie Daily Times and the Sunday Times-News. This is one of those storms that people still remember, even though it took place more than 40 years ago, December 15-16, 1972. According to WJET/FOX 66 meteorologist Tom Atkins, the storm dumped 9" of snow in the City of Erie and 12-18" inland, causing hazardous driving conditions, numerous automobile accidents and severe flooding to Presque Isle, the Public Dock and the Coast Guard Station. Nine inches of snow doesn't seem like much if you grew up in Erie, PA, but wicked gusts of wind and drifting snow can quickly wreak havoc. "State police in the area advised all motorists to stay off the roads, which were considered extremely hazardous. Interstates 79 and 90 and Rt. 89 were reported to be passable 'only at times,' according to one trooper at Lawrence Park. 'We just can't keep up with the snow. You might as well paint your windshield black. '"- Erie Times-News December 17, 1972. Driving on the highway into a snowstorm can make for a white-knuckle ride. Some of my worst memories include driving home in blinding snowstorms, staring directly into the hypnotizing effects of snow and trying to avoid looking at the headlights of oncoming cars. Or worse, trying not to panic when being passed by a semi, which would whip the snow into a giant, tornado-like cloud of whiteness. My grandmother often repeated a story of driving home in such a storm. My grandfather followed the tail lights of a vehicle for quite a while and wondered why the car eventually came to a complete stop. Grandpa got out to investigate and discovered that he had followed someone right into driveway of the house where they lived. That story still makes me laugh to this day. Old Time Erie photo ©Sandra K. Sagala. Published with the permission of the photographer. Western Provision Market was on West 4th St. near Cherry in Erie, PA when this photo was taken around 1960. Again, another shot with some cool old cars! ('57 Chevy?) Check out the prices for meat: round steaks, sirloin steaks and t-bone steaks were only 75¢ per pound. Ground beef was 3 pounds for $1.25. Chuck roast was 39¢ per pound and ground chuck was 69¢ per pound. There were a number of Western Provision stores in Erie, including this one at 560 West 4th St. The store had a butcher in a white apron who would cut meat to order. You could also ask for ham, bacon, sausage or meat from the chilled display case. The butcher would measure out a specific quantity on the scale, wrap it in butcher's paper, seal it with a piece of masking tape and write the price on the package with a black mechanical grease pencil. The people who ran these stores knew everyone in the neighborhood by name. City Hardware was located next door at 558 West 4th St. The Gem Social Club, which is not visible in this photo, was a few doors away at 552 West 4th St.
"Mayor Declares State of Emergency Here." "PA Equipment is Sought for Snow Removal in City"
"More Snow Due as City Digs From Under Record Snowfall"
Was this the big Thanksgiving 1956 snowstorm? Not even close. "For us here in Erie the granddaddy still seems to be December 11-12th, 1944. That was the snowstorm that produced the record for the most snow in 24 hours in Erie…26.5". People still talk about it to this day," said Tom Atkins, meteorologist at WJET-TV in Erie, PA.
That's more than two feet of snow, falling at more than one inch per hour. The stories are incredible. A 5' snow drift blocked the doors at Eckerd's and other stores in the 1100 block of State Street. A Erie Coach Company snowplow got stuck in a drift at 10th and State. Motorists were stranded all over the City of Erie. Most streets were impassible. If that wasn't bad enough, the snow kept falling….and falling. On Dec. 14th, officials at area shops that were involved in the war effort asked the government to send tractors to clear the roads. 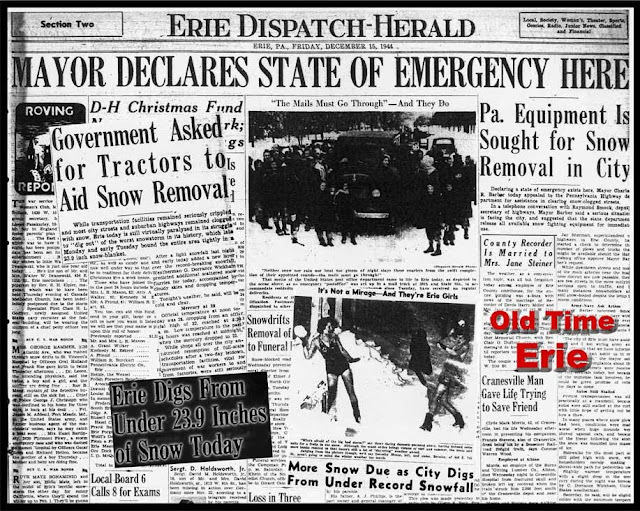 Erie Mayor Charles R. Barber declared a state of emergency on Dec. 15th. There were reported shortages of milk, bread and coal. Back in those days, you didn't go to Dairy Queen to get a Blizzard. You just stepped outside. One little girl made a grand entrance into the world. "Dr. Louise G. Brecht enlisted police aid in battling her way to the home of Mr. and Mrs. Russell Harkins, 2916 French St., where [a] baby girl was born at 11:40 a.m. after an ambulance failed to get through. Unable to drive her car, Dr. Brecht called for a police cruiser, which was able to take her only to 26th and State Streets, from where she walked, arriving a full hour before the event." Do you remember where you were 69 years ago today? Click here to share your story. For the latest weather report check out WJET-TV. Thanks to Tom Atkins and Jill McCormick for the Old Time Erie plugs during the Fox 66 TV and WJET TV weather trivia segments on Dec. 11, 2013 and again on December 12, 2013. I have been a good girl this year. Well, most of the year. Please bring me these items from the Dahlkemper's Christmas catalog. I will leave cookies for you if my sister does not eat them all. 8) Symphonic 13" color TV/VCR combo. I bet this will last forever! P.S. I found all these items in the Dahlkemper's Christmas 1991 catalog! "Can you send me a picture and some info about the Big fish restaurant on Peninsula Drive from back in the 40's and 50's" When I was a kid we pass it on the way to the beach. My mom and I took the bus from Wesleyville and had something to eat in the late 40's. The whole front of the place was shaped & painted like a fish only BIG. I was telling my daughter and granddaughters about it." "I'm at work in southern California and just found out about your website. So happy!!! Grew up in Erie in the 50's and 60's. I visited there last summer and loved seeing all the old favorite spots. This summer I was telling my kids and family about the 'Big Fish,' a huge wooden structure in the shape of a fish that was in front of a restaurant on the corner of Peninsula Drive at the entrance to the beach. I Googled it and couldn't find where the Erie Times new or anyone had any pictures of it. Do you have any?...or could you put it out on your blog in case some out there has an old photo?" 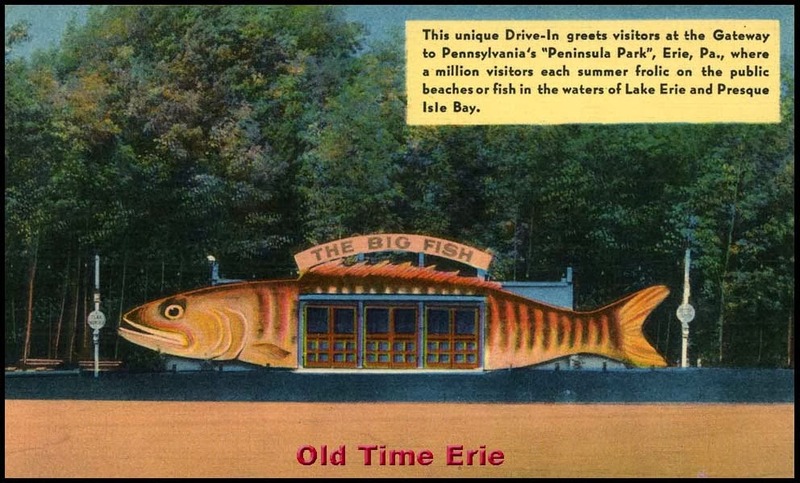 Jerry Skrypczak (co-author of Fortune and Fury, a history of commercial fishing in Erie) was kind enough to send a postcard of the Big Fish. I bet there are a lot of tourists who spent their summer vacation visiting Presque Isle State Park that would remember this place. Oh, Steve and Pat, now your kids won't think there was something fishy about your stories. 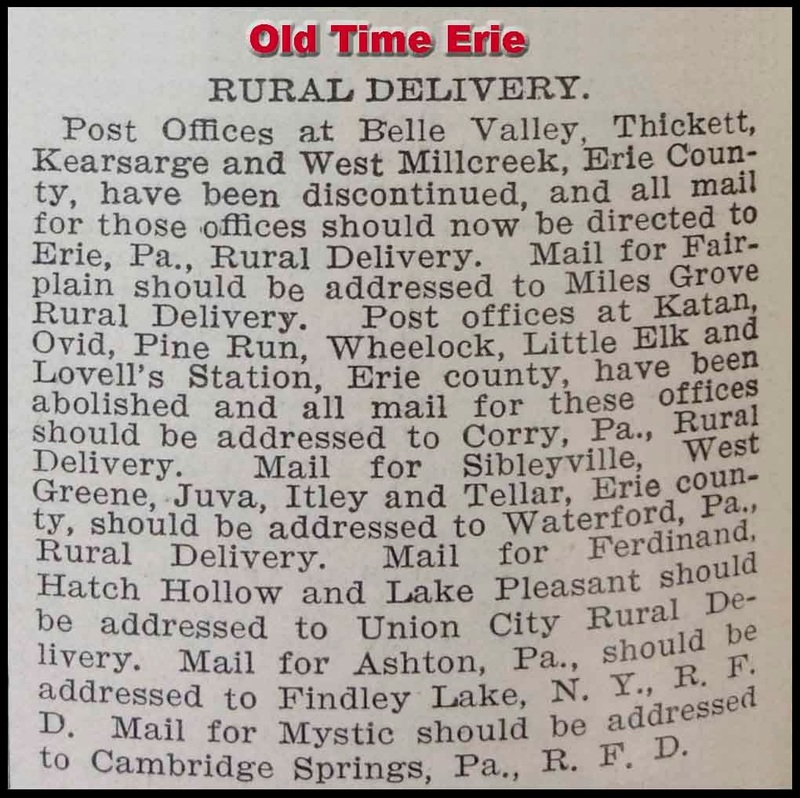 Before consolidations and budget cuts, there were more than 50 post offices in Erie County, PA. 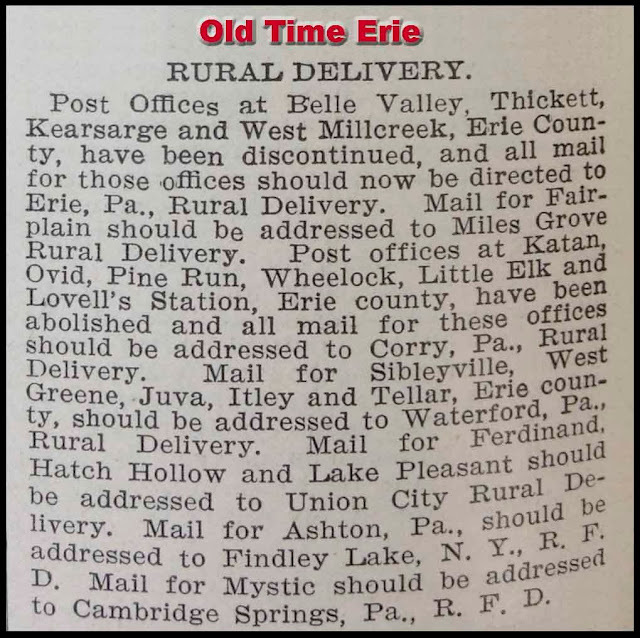 The photo above shows the rural delivery routes for the County of Erie in 1903. There are lots of names that you don't hear of anymore. Does anyone know where Northville was? Wolff's Department Store was located on the northwest corner of 13th and Parade Street in Erie, PA. Nathan Wolff established the business in 1898 and it was later run by his sons, Max and Herman Wolff. This discount retail store still existed in 1963. "The Wolff Brothers have in addition to the 13th and Parade store opened the giant surplus stores in Erie and have used all the excess space in the Parade St. store for warehousing, which is now bulging with first quality merchandise, including all the heavy winter needs necessary to all of you for Erie's long winters." The sale items included oxfords, sport shirts, chino slacks and children's dresses for 99¢ each; Dungarees, rugs and flatties for $1.44 each; work pants for $2.57 and work shirts for $1.99. They also had ladies' dress heels for $3.99 and men's work shoes for $2.77. Need a pair of work gloves to haul scrap metal or build a shed in the backyard? Those would set you back 33¢ per pair in 1963. The building that housed Wolff's Department Store at 1228 Parade Street was demolished. It is now a vacant lot just south of a Country Fair store and gas station. Remember back when you bought a new car and they gave you a token of their appreciation for being a loyal customer? 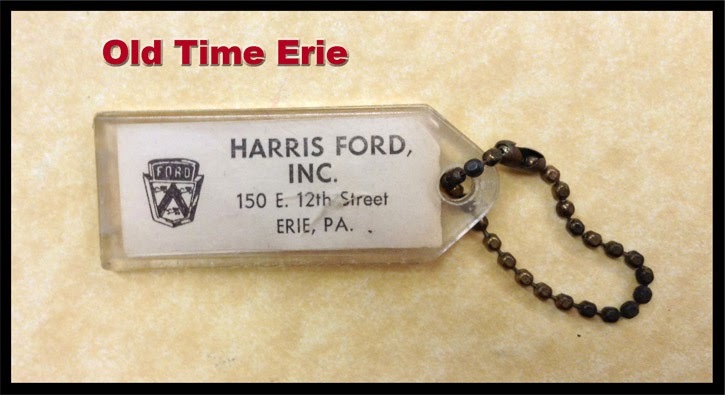 Here is one such item, a Harris Ford key chain fob. No automatic car starter or heated seats in these old vehicles. If you left your headlights on, your battery would be dead after a few hours. Much simpler times then, without a need for ten keys for opening doors. The cashier didn't need to scan the barcode on your grocery store loyalty card on your key fob because the cashier at your neighborhood food market most likely knew you by name. Harris Ford was located at 150 East 12th St. in Erie, PA. There was a cluster of new and used car dealers on Twelfth Street at the time. When I look at old postcards I find it odd that people dressed so well to go fishing, to a picnic or to the beach. Take these young boys for instance. No hip waders here. They look like they just went to church and decided to catch dinner on the way home. Maybe that's why they are using tree limbs as fishing poles. This scenic photo was taken near the Lawrence Park Gold Club, which was established in 1921. Are these young men spending some quality time with their fathers at the mouth of Four Mile Creek? The man in the middle looks like he is standing in the water all by himself, looking out at Lake Erie. I hope the boys had a bucket to carry their fish home in. The S.O.N.S. of Lake Erie sponsor a pretty cool program to encourage sport fishing in Erie County. You can check out a fishing pole and a tackle box for free at the Blasco Memorial Library on the Bayfront or the Iroquois Avenue Branch Library in Lawrence Park. 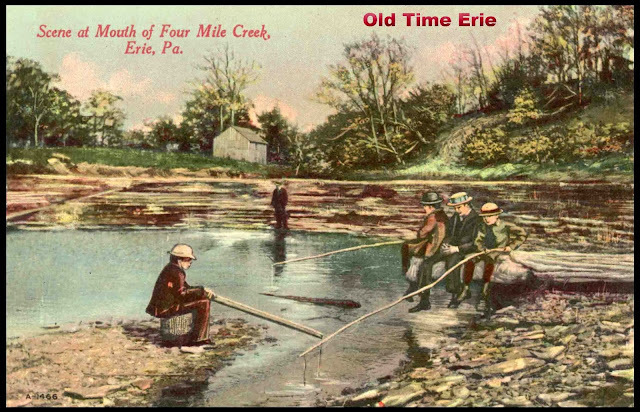 And here's a little bit of fishing history: A new fish hatchery was built in Erie in 1914. Fishing licenses were first required in 1922, when a resident fishing license cost $1. The fee was raised to $1.50 in 1928 and to $2 in 1948. The Pennsylvania Fish Commission collected $207,425.53 the first year. The daily creel limit for trout was set at 25 in 1925. Other limits were: 10 bass, 10 walleye, 15 pickerel and 3 muskies.